Fr Peter McCawille SMA has produced a timely memoir of the early SMA and other missionaries who worked in what was known in the past as MidWest Nigeria. Today it covers Bayelsa, Delta and Edo states in the 36 State Federal Republic of Nigeria. Msgr Jean-Baptiste Chausse and Fr Théodore Holley sailed up the Niger River and, in 1884, a permanent Mission was opened in Lokoja. Due to the high death rate among the early missionaries, the Mission was officially moved to Asaba in 1892, though an Italian SMA priest – Fr Carlo Zappa – was already resident there since Pentecost Sunday 1888. Fr Zappa is undoubtedly the giant among the early missionaries and extended the Church until his death in Asaba in 1917. Bishop Thomas Broderick succeeded Zappa and he, in turn, was succeeded by Bishop Leo Hale Taylor SMA and, on his appointment as Archbishop of Lagos, he handed over to Bishop Patrick J Kelly SMA. As Vicar Apostolic of Western Nigeria his territory stretched from south of Warri on the Niger Delta to Lokoja and Oka in the north, westward from Asaba on the River Niger to Benin City and beyond. 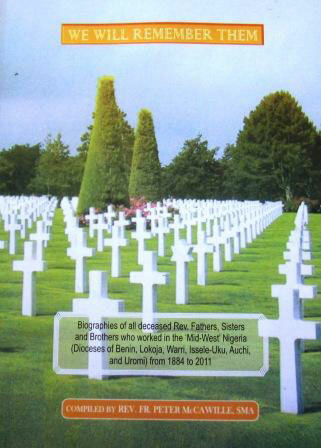 Fr McCawille’s book – We will remember them – details the lives of priests, brothers and sisters in tihs huge territory. There are six dioceses in the area today and Fr McCawille gives an account of the deceased diocesan clergy. The deceased members of nine Congregations of Sisters as well as ten male groups are recorded in this 330 page book. Copies of the book can be bought from the Communications Department, African Missions, Blackrock Road, Cork. Cost: €16 including packing and postage. Cheques / Postal Orders payable to Society of African Missions.